"One, it's a love in one generation / Two, the two of us go to hell / Three, even though we kill everybody / Four, signpost for the land of the dead..."
Set in feudal Japan, Curse of the Undead Yoma was first released in 1989, based on the manga of the same title by Kei Kusonoki, a woman artist whose work (which also includes the popular Ogre Slayers series), while graphic and bloody, was targeted to a female audience. 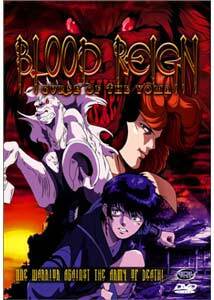 ADV first released the two part OVA subtitled in 1995, then dubbed as Blood Reign in 1998. The complete OVAs are presented here.In a field strewn with the bodies of slain warriors, two members of the Takeda clan grimly survey the carnage. Ninjas Hikage and Marou have been friends since childhood, but all that is about to change. Later that night, without explanation, Marou denounces his samurai background, and sets out to leave their village, but not before embedding a poisoned shuriken in Hikage's eye. Later, Hikage is charged with tracking down Marou to stop him from spreading word of their lord's death, a fact that would bring shame to their clan. He sets out alone, but is shadowed by ninjas.His path leads to a waterfall, where an old priest offers to read him his last rites�this is a place where those deep in despair come to end their suffering. The atmosphere in the nearby village is one of carefree joviality, and Hikage is welcomed without question. Upon his arrival he glimpses Marou, who doesn't recognize him, but his later search for his friend turns up nothing. Hikage meets Aya, a young woman whose face is horribly scarred, who tends to his dressings. Upon further investigation of the region, there is something odd�there are no fields of rice, and no other signs of life. He soon discovers the presence of the Yoma, demonic creatures that feast on the dead, but there is a secret he has yet to unearth surrounding the king of the Yoma, Kikugo no Miko, whose plans for humankind will have catastrophic repercussions. As Hikage's quest for his friend carries him deeper into this world of monsters, what he will find is his worst nightmare.The show is dark and leans heavily on stylistic ninja elements and monstrous, morphing villains. While packed with bloody battles and steeped in plenty of graphic depictions of dismembered corpses, Blood Reign evidences the shoujo origins of its manga author with an underlying, if poorly developed, love story. Despite showing its age in character design and pacing, the show has some redeeming qualities in its storytelling, which was better than expected, with a few interesting twists. The short run time does affect the character development, and the background relationship between the male leads is done in flashback to the same animation, which gets a bit repetitive. The romance aspects also suffer, but add a bit of depth to an otherwise meditative action adventure and series of monster slayings. Some of the demons are a bit on the lame side, but only because the genre has been done to death in the intervening years, and there are notable influences on later works that can be seen here. Due to the graphic violence, this would not be suitable for younger audiences. It may not be as over-the-top as more recent ninja stories, but it is an entertaining, if somewhat familiar, 87-minutes of animation. Image Transfer Review: Considering its age, the image quality is pretty reasonable. Grain is visible throughout, but is rendered well. The first episode shows a number of minor nicks and scratches, and the clarity of the DVD also makes dirt on the cels more evident. The color palette is muted, adding contrast to the copious amounts of blood that is spilled during the running time. Black levels are fine. There is a small amount of cross-coloration in places such as hatched linework, but it is usually unobtrusive. Audio Transfer Review: Both original Japanese and English dub are available. The stereo soundtrack is pretty center focused, with only mild directionality of any kind. Audio is clean and distortion free, and has a good tonal balance. The dub is passable, but I'd recommend sticking with the original Japanese. Extras Review: Both Japanese and English trailers are provided, as is a section for dramatis personae, covering the male leads and the main characters in each of the two installments, which are given separate screens. Each brief description is accompanied by a link to a video clip, with language selectable via remote.Standard ADV previews for Ninja Resurrection, Samurai X, Blue Seed, Gasaraki, Sorcerer Hunters and Original Dirty Pair are included. In addition to listing the chapter stops, the insert features the lyrics in English and romaji for the counting song, which plays a central role in the story. For fans of graphically violent, ninja-based adventures, Blood Reign: Curse of the Yoma presents a decent, if somewhat dated story, pitting a lone warrior against a sea of demons. There is enough depth to the tale to make this more than just a gore fest. It wouldn't be my first choice for the genre, but still has a place in the collection.